Android may have been the belle of the I/O ball on the conference’s first day, but our devices and homes may not be the only things under Google‘s purview. Looks like cars are about to get in on the action. No, you won’t be able to gyroscopically steer your bucket of bolts from your smartphone, but someday you may be able to own a vehicle that can individualize its performance to your habits. Ford is now using Google’s Prediction API to improve fuel efficiency by using data like route, time of day, and real-time traffic and location data. The key basis of this approach lies in the fact that the way people drive impacts gas mileage. Or in layman’s terms, your car will get to know you and your driving patterns over time. And the more it knows, the better it will be able to predict how to optimize performance and save those precious miles per gallon. Given that gas is over $4 a gallon in my area, I consider it good news to see a car maker actively working on this. Hopefully it won’t take too long before we actually see these in showrooms. How else could you integrate Google in the automotive industry? Tell us your most brilliant (or fantastical) ideas. DEARBORN, Mich., May 10, 2011 – Ford researchers are harnessing the power of cloud computing, analytics and Google innovation to identify technologies that could make tomorrow’s vehicles smart enough to independently change how they perform to deliver optimal drivability and fuel efficiency. 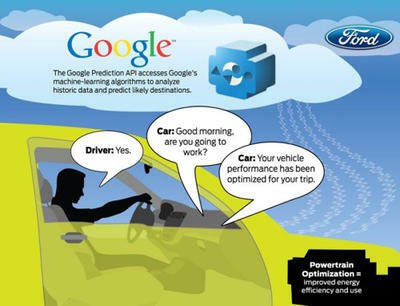 Ford researchers are applying Google’s new Prediction API to more than two years of their own predictive driver behavior research and analysis. 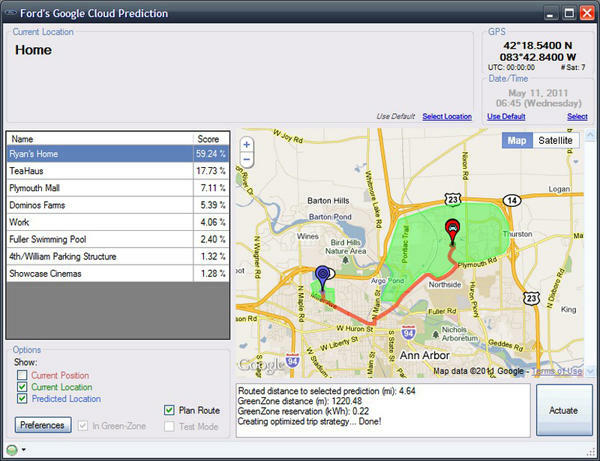 The Google API can convert information such as historical driving data – where a driver has traveled and at what time of day for example – into useful real-time predictions, such as where a driver is headed at the time of departure. • After a vehicle owner opts in to use the service, an encrypted driver data usage profile is built based on routes and time of travel. In essence, the system learns key information about how the driver is using the vehicle. • Upon starting the vehicle, Google Prediction will use historical driving behavior to evaluate given the current time of day and location to develop a prediction of the most likely destination and how to optimize driving performance to and from that location. • An on-board computer might say, “Good morning, are you going to work?” If the driver is in fact going to work, the response would be, “Yes,” and then an optimized powertrain control strategy would be created for the trip. A predicted route of travel could include an area restricted to electric-only driving. Therefore, the plug-in hybrid could program itself to optimize energy usage over the total distance of the route in order to preserve enough battery power to switch to all-electric mode when traveling within the EV-only zone. “Once the destination is confirmed, the vehicle would have instant access to a variety of real-time information so it can optimize its performance, even against factors that the driver may not be aware of, such as an EV-only zone,” said McGee. Integral to this next-step work is personal information security, an issue that is of the utmost importance to Ford. “We realize that the nature of this research includes the use of personal data and location awareness, something we are committed to protecting for our customers in everything we do,” notes Kristinsson. “A key component of this project is looking at how to develop secure personal profiles that will ensure appropriate levels of protection and specific data use only by the driver and the vehicle to deliver the best driving experience.